– endurance, intensity, speed, recovery, racing. How: Bounding can be done with or without poles. The motion should closely imitate classical skiing. To focus on strength and explosiveness do shorter intervals focusing on getting maximum distance with each bound. For intervals try to use the explosiveness, rhythm and intensity that imitates ski racing. 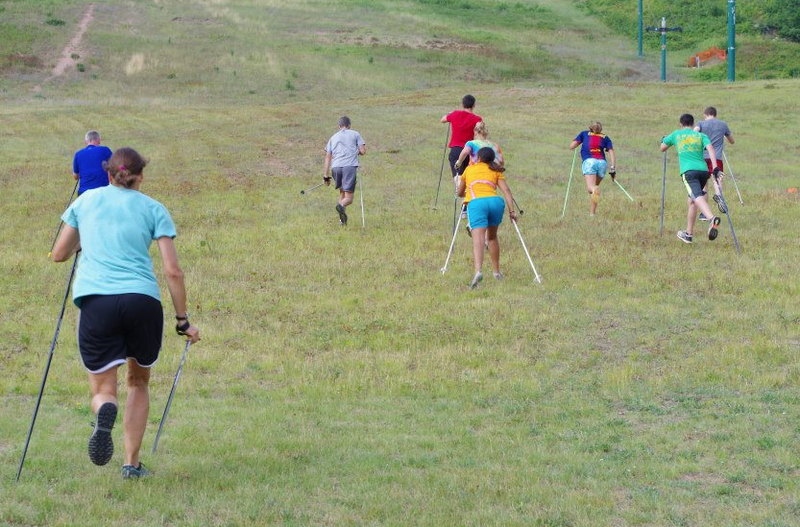 How: Ski walking can be done with poles, but is generally done without them. It should closely imitate classical skiing. It can be incorporated into running endurance sessions on steep and/or long uphills and be used for intervals on uphills. Poles should be about 2 inches shorter than poles used for classical skiing on snow. How: The focus is on getting maximum distance on each of 10 to 15 hops. Do sets of 10 to 15 hops and take full recovery (2-3 mins) between sets. Skating spenst can be done by hopping from side to side in one place, or jumping sideways up a steep hill. Classical spenst can be done by hopping on one leg at a time up a steep hill, or by bounding with both legs up a steep hill. Be imaginative, and warm up and down very, very well. How: use a wide variety of lifts that cover all major muscle groups. How: set up a circuit of exercises that alternate stomach, back, legs, arms. Spend half a minute to a minute and a half at each station and move from one station to the next without stopping.